In the fall of 1960 and winter of 1961, Triumph was in dire straits, largely due to a credit crunch in England. Although its sports cars were selling well in the United States, where Triumph had 700 dealers, the company sold few TR3As in England. Merger talks with British Leyland started on Nov. 14, 1960. On December 5, Leyland announced it was taking over. A smaller, new sports car, based on the Triumph Herald sedan, had been discussed at Triumph in 1956-1957. A year later, Austin-Healey—long thought of only as a maker of “big” sports cars—issued the diminutive Sprite and showed there was demand for a small, cheap sports car. MG already had a foothold in this niche with it “Midgets.” A boxy new MG Midget was introduced in 1962. 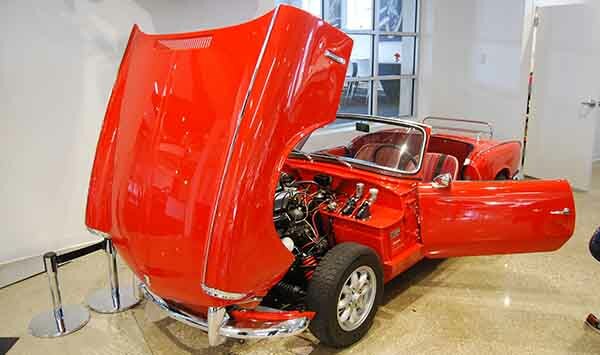 To compete with its marketplace rivals, Leyland moved Triumph’s small sports car project to the front burner and the decision proved to be a wise one. The Spitfire 4 was made available for sale in late 1962 (in England) and wound up selling more copies than its two British rivals combined. Italian stylist Giovanni Michelotti, who did the Herald, was credited with the Spitfire’s design. The name of the new car came from a famed World War II British fighter plane. According to one account, Air Marshall Tedder, the chairman of Standard-Triumph was responsible for obtaining an OK from Vickers aircraft company to use the Spitfire name. Supposedly, the head of Vickers wanted to use the Vanguard name on an airplane and Tedder agreed so long as Triumph could use the Spitfire name in exchange. Car & Driver took a cover photo showing the new sports car with one of the vintage military planes and Triumph later made it into a poster. The four-wheeled version was actually called the Spitfire 4 at first. Based on conversations with Triumph executives, Italian designer Michelotti turned out a great-looking prototype of a small sports car called the “Bomb.” Unfortunately, it was delivered when Triumph was just on the verge of bankruptcy. The prototype was pushed into a corner of an experimental workshop, where it sat until Leyland came along. Sales Director Donald Stokes saw the car as a path to increased export sales and profits for the company. Work began and minor changes were carried out over the following 18 months. The new car was introduced at the Earl’s Court Motor Show, in London, in the fall of 1962. Up front was a small split grille, consisting of two side-by-side rectangles. The headlights were partly recessed and the doors were just slightly cut-down. The sus­pension was the same fully-independent design used in the Triumph Herald, but it was mounted on a new back­bone-style chassis with a shorter (83-in.) wheelbase than that of the Herald. 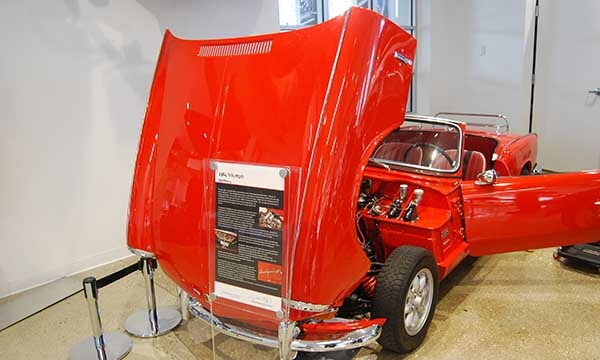 Welded monocoque (unibody) construction was employed and the hood and front fenders tilted upward as a unit, for excellent access to the engine bay. Unibody construction made the Spitfire 4 a very sturdy little car. The doors were made a little larger than Michelotti’s original design so that they could completely hide the wind-down windows when lowered. 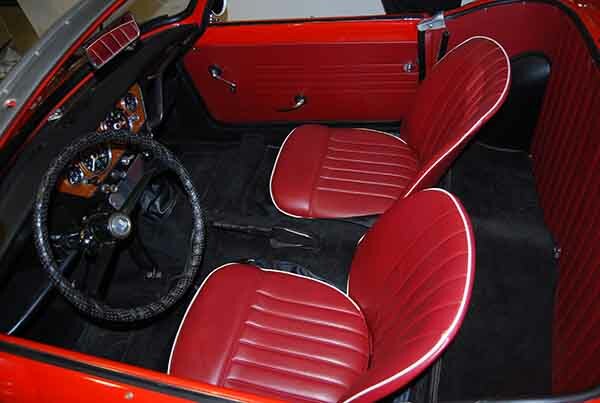 The Spitfire 4 had unusual, exterior body seams that were covered with chrome finishing strips. This made it much easier and cheaper to weld up the bodies. Early Spitfire 4s had gauges housed in a panel in the center of the dash. Two large dials closest to the center housed the speedometer and tachometer. The fuel and temperature gauges were in smaller round circles flanking the larger ones. There were warning lights for oil pressure and generator. Four control knobs ran across the dashboard below the center panel. Most Spitfire 4s featured left-hand drive since sales were aimed at the American market. A rubber floor mat was provided. There was a stowage space behind the seats. Two open glove boxes were seen, one on either side of the dash. The bucket seats had low seatbacks and body-hugging contours. The drive train layout was a conventional front-engine, rear-drive design with a four-speed manual gearbox in the middle. Overdrive was available as an option. Rack-and-pinion steering was fitted. Up front were unequal-length A-arms with coil springs. The rear suspension featured swing axles with radius arms and transverse leaf springs. Disc brakes were used aft, with drums at the stern end. Triumph put the Spitfire 4 on sale in autumn 1962. It continued to be marketed until Decem­ber 1964. It was introduced to Americans at the 1962 Chicago Auto Show. The Spitfire 4 came only as a roadster. The East Coast Port of Entry price was $2,199. It weighed 1, 474 lbs. Road tests put top speed at 92-93 mph. The 0-to-60 mph acceleration was in the 15.5 to 16.5 sec. range. 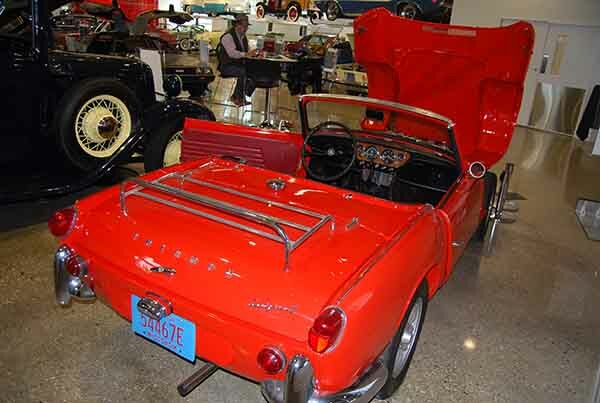 About 45,753 Triumph Spitfire 4s were produced from 1962-1964. During the car’s first year on the market, Triumph’s U.S. sales climbed 25 percent and overall sales went up 30 percent! Sales continued on a strong trend. Starting in April 1964, monthly sales records were set for several months running. In April, 2,264 cars were sold and over 1,000 of them were Spitfire 4s. Drivers David Hobbs and Rob Slotemaker drove a competition version of the Spitfire 4 at Le Mans and took a third in class. Their car had an aerodynamic fiberglass fastback roof. Slotemaker then teamed with Terry Hunter to take a class win in the Tour De France. Valerie Pirie, a female driver on the Stirling Moss Auto Racing Team campaigned another Spitfire 4. Spitfires also won three SCCA divisionals. Today, enthusiasts call the Spitfire 4 the Spitfire MK 1. A modified Triumph Herald over­head-valve engine was used. The in-line four had a cast iron block with a 69.3 x 76-mm bore and stroke it displaced 1147 cc. 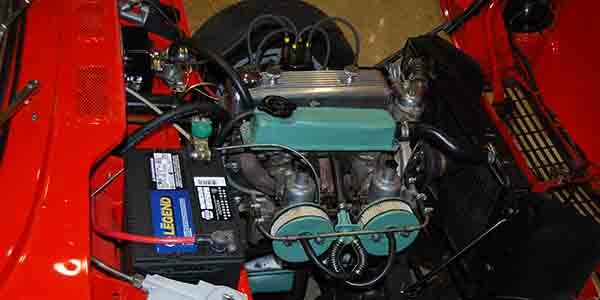 It featured three main bearings, solid valve lifters, an 8.5:1 compression ratio and twin SU carburetors. It was rated for 63 hp at 5750 rpm. The Spitfire 4 had an 83-in. wheelbase and 145-in. overall length. It was 47.5 in. high and 57 in. wide and had a 49-in. front tread and 48-in. rear tread. The standard 5.20 x 13 tires were mounted on disc wheels. Center-locking wire wheels became available for slight extra cost starting in 1963. The featured car belongs to The Automobile Gallery (www.TheAutomobileGallery.com) of Green Bay, WI. It has Metric radial tires, MiniLite style Minitor fog lights, eight-spoke alloy wheels and an optional trunk rack.